I'm going to be honest with you here. I'm not really paying attention to what I'm writing because I'm watching the new season of Orange Is the New Black while I'm putting this post together. I've haven't exactly been loving the past few seasons, and I'm not sure how I feel about this new one, but I can't look away. So forgive me if this isn't the most eloquent post. 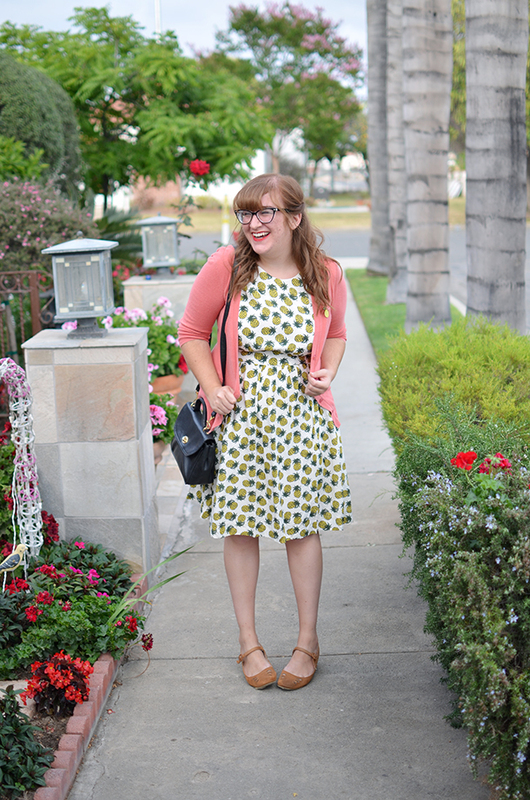 Why pay attention the writing anyway when this dress does all the talking? 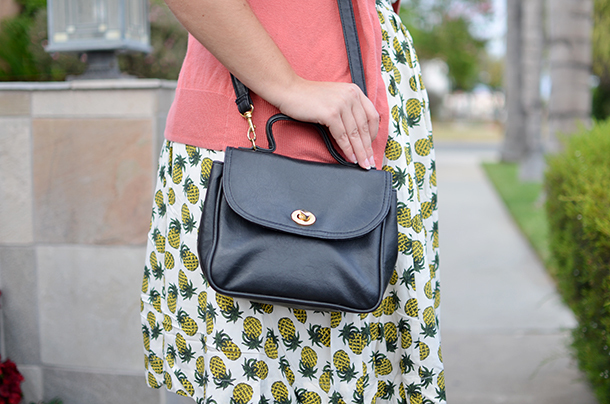 I took advantage of Modcloth's Memorial Day sale (as well as possibly a few others...) and finally got my hands on this pineapple print dress. Emily and Fin's newest collection is seriously the cutest, and I have my eyes on a few other pieces as well. I ended up stopping at my favorite thrift store, Saver's, on Saturday and picked up this cardigan, which will probably be making plenty of appearances soon. This may just be my new favorite outfit. Other than a Saver's trip, this weekend was pretty uneventful, but nice. Some friends and I had a movie night on Friday night, and we had dinner with Jon's parents on Saturday night. The most exciting thing to happen, though, is that my work treated me to a Disneyland pass! I've been wanting one for ages, and my whole family is getting them so I can't thank my bosses enough. Despite the fact that I live right around the corner from Disney, I actually haven't been in three years. Those tickets are expensive! I'm so excited to start going all the time now. Well, as much as my pass allows. There are a ton of blackout days, so I might not be going all the time, per say. But hey, better than nothing. 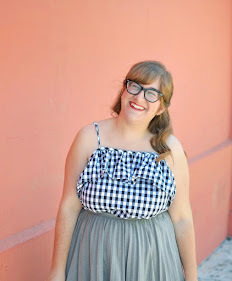 Oh my gosh, that dress is SO CUTE!! 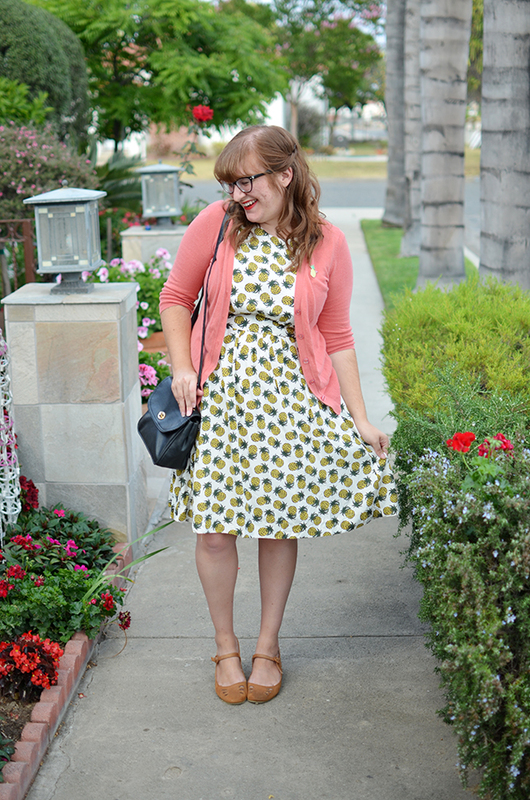 I love it paired with that cardigan too. The dress is cute and congrats on getting a pass. Very nice of your bosses. Hope to see some photos from there make it your blog one day. 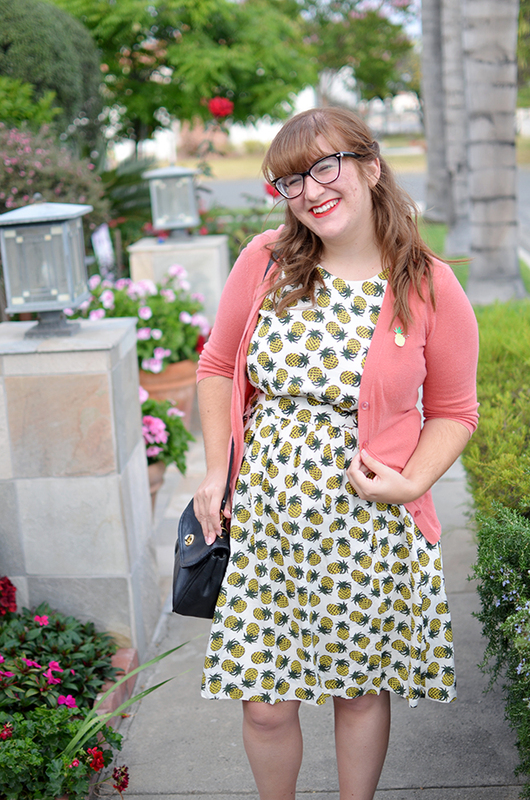 I look forward to seeing adorable outfit posts from Disney! 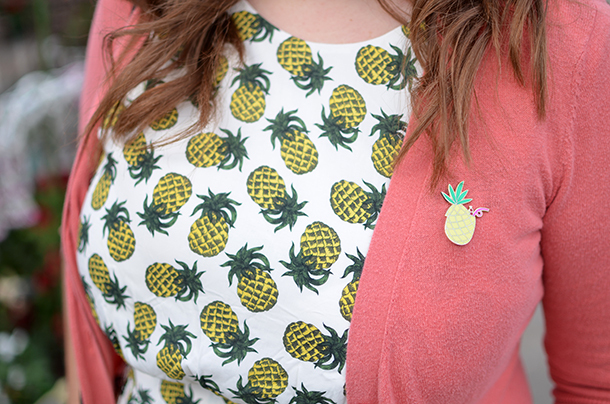 I would make a dad joke like "Oh, look, you got some pineapple on your dress!" but I will refrain and just say how cute you look. 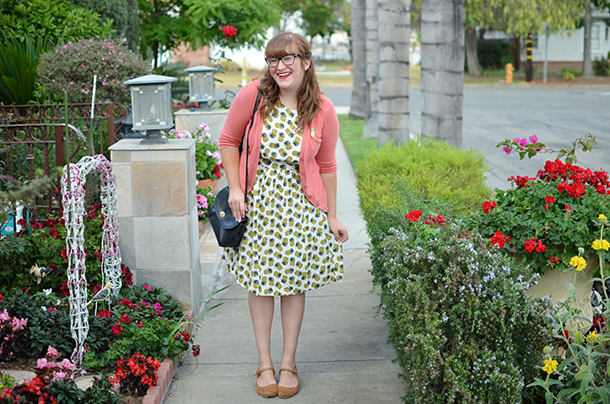 I never would have thought to pair a coral cardigan with this dress but I'm lovin' it!